Grand Re-Opening and Give Away! If you have been to GA Organic Outpost lately, you've seen that we have been under construction for the past couple of months. We were working on our packaging, streamlining our products and making our website more user friendly. Well, we are slowly starting to roll the product and apparel back out. 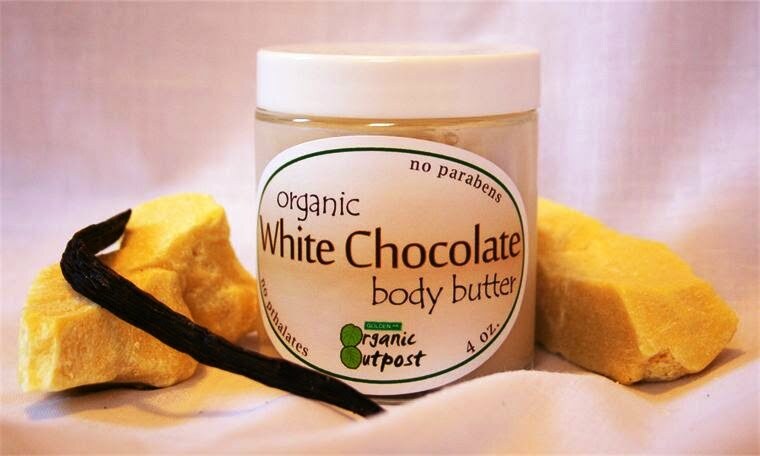 Starting with our most popular item, Organic White Chocolate Body Butter! In honor of our Grand Re-Opening, we are giving away 25 sample sizes of White Chocolate Body Butter. At this time we only ship to the United States, so this offer is only available to U.S residents. The Give Away will continue until we have given away all 25 of the Body Butters. I'll post here when they're gone! It's A nice site I hope you will add more items!! Thanks! We will be adding them back very soon :) Send me your e-mail addy if you would like to try the WCBB. Site looking good! Keep it coming, we need natural/organic choices like the ones you provide. Thanks Biz, I'm glad that more people are seeking out organic! Let me know how you like the body butter! It looks great! Its an easy layout and easy to navigate. I'm looking forward to more products! It looks great! Its easy to navigate. I'm looking forward to more products. I love the way the body butters and oils make my skin feel after a shower...not to mention the delicious smell. Keep u the great work. Thanks Letha and be sure to email me your mailing address!